Being a graphic designer entails a distinctive mix of excellent communication, patience, skill, creativity, and a touch of business savvy, all of which require nurturing to stay at their best. Whether you’re reading up on your favorite design movements, watching tutorial videos to learn new shortcuts, or checking out blogs for inspiration, design resources are indispensable to a prosperous career in the field. All designers need to constantly stock up on fonts, stock photography, and graphics, in addition to rely on valuable tools to get their work done efficiently and successfully. The comprehensive list of Design Resources for Designers may seem dauntingly incessant, but it doesn’t have to bleed you dry. From selecting the best color palette and finding the right visual assets, to choosing the perfect typography, these wealth of free resources would make your work shine. FastCo. Design is a child of the Fast Company family of blogs. They are specialists in covering design related editorials, interviews, trends, and news. With an accent on business and business perspectives, they aspire to leverage design as a window into culture at large. The blog focuses on both design and business, in addition to all the areas where these two topics overlap. For all designers seeking some inspiration, the blog is replete with engaging and wow-worthy content. The Design Blog is a collection of great works from designers and studios around the world. The carefully selected works definitely echo the tagline of the site: “Don’t just be a designer – be a good one.” The site features themed content daily and makes them easily searchable through categorizing all articles into 26 different tags pertaining to separate areas of graphic design. Canva is just the right tool for non-designers aspiring to create top-notch designer-quality products. The Canva Design School educates its users with business and branding identity insights, business advice, intuitive graphic design options, as well as easy to follow tutorials. If you’re involved in any craft that entails strong visuals, or just getting to grips with design, Canva blog is your go to place. Creative Market is a bustling marketplace for digital design goods such as fonts, vectors, icons, and more, in addition to churning out first-rate articles dedicated to design. Their blog offers latest trends and fresh design ideas to designers. Their articles span a wide spectrum of subjects, from inspirational quotes to current design trends, a fun weekly column called Designer Problems, and step-by-step guides to launch your own blog. All designers who have worked on web projects before must be acquainted with Creative Bloq. Using an unconventional and fresh style, it addresses topics in the fields of digital art, 3D art, web design, and graphic design. Regardless of the kind of design you are into, you are sure to stumble upon some inspiration, tricks, and tips at the creative Bloq. Bonus: there’s a fun trivia quiz every Friday! Brain child of design lover Alex Goh, DesignTaxi was founded in May 2003. DesignTaxi prides itself in staying abreast of innovation, creativity, and design, where it is at the forefront of forecasting global trends and delivering cutting-edge information and news to the creative industry. The highly resourceful design blog Abudzeedo has been around since 2006. It collects valuable information and resources for useful tutorials and visual inspiration that serve designers. The blog features subjects like typography, photography, logos, interviews, illustrations, sites of the week and more. Tutorials are categorized according to the software program they focus on, while simultaneously incorporating shorter quick tips and longer case studies. Brand New was born in 2006, as a division of the well-known blog network and design firm “UnderConsideration LLC”). The site provides expert opinions on brand and corporate identity works. The site is divided into three sections: Minor Descriptions, objective notes, and detailed reviews. The Inspiration Grid blog is a goldmine of visual-oriented block content, covering a wide array of themes and topics that span across everything creative. This website is centered on one man, David Airey; as one can easily surmise from the name. David Airey is a graphic designer and a writer, who has worked for renowned companies such as the Asian Development Bank, yellow pages, and BBC. His website doubles as a collection of inspirational pieces for designers and his personal portfolio. At just 25, Jacob Cuss has carved a niche for himself in the graphic design world, having been published in everything from art magazines to guidebooks, and winning a slew of awards. His blog, JUST Creative Design, is replete with personal graphic design work updates, guest posts, resources, and design tips. A sister site, called Logo of the Day, features a winning logo submission from fellow graphic designers every day. The “Logogeek” blog serves as a repository of informative and well-written articles for designers, particularly those who specialize in branding and logo designs. Graham Smith’s blog, the Logo Smith, features articles on how to make memorable logos and latest news from the logo design world. The blog also provides links to his design inspirations, all while keeping the design simple. The blog also incorporates guideline pack downloads, a free spec sheet, and a plethora of brand identity posts. The Design Observer Group features the latest works on social innovation, urbanism, pop culture, and design, all while bringing out the best creative in their respective fields. Since design is ever evolving for the better, the blog “observes” people and design shifting into exiting dimensions. The chic vintage business-sign feel of the blog makes sure it doesn’t disappoint visually. Oriented toward the professionals, Designer is one of the world’s leading online portal for creative. They aspire to engage and inform designers, and focus on competitions and news. Launched in 2008, Logo Design Love is the “sister” site of Identity Designed. Originally a book on logos, Logo Design Love has evolved into a well-known website that offers myriad perspectives on logo design. The site features top-notch opinionated articles on a plethora of fabulous subject matter. Promising a daily dose of photography, graphic design, and art inspiration, the blog primarily caters to those in the creative industries. The blog is a repository of useful resources and practical tips from some the best contributors, including Anthony Wood. Awwwards is an organization that promotes and acknowledges the efforts and talents of the best web agencies, designers, and developers in the world. Their blog is a holy grail of valuable content for web developers and designers. Founded in 1914, The Professional Association for Design is the largest and oldest membership organization for design in the US. 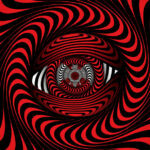 Their blog, Eye on Design, features stellar content from a whopping 122 respectable contributors, in addition to offering top-notch write-ups on some unique topics. The simple personal blog curated by Daniel Nelson in 2009 is entirely centered on visual inspiration; be it for illustrators, photographers, or graphic designers. The blog would get the creative juices flowing of all Professionals hailing from any aspect of design. Spoon Graphics is the brainchild of Chris Spooner, a graphic designer who aspires to share in-depth articles, interesting tutorials, and an assortment of freebies that artists can use in their own work. His blog features stock material such as fonts, icons, brushes, and patterns for designers who want to garner access to high-quality collections. Since it was first founded as a simple mailing list in 1997, the stellar publication features in-depth pieces centered on the best practices in web development and design. The blog shares hefty content, upholding the highest of standards, while also featuring new voices for their interesting perspectives regarding web content. At its heart, Creativeoverflow is entirely devoted to design, but they also feature plenty of articles pertaining to finances and work productivity that can be of value to professionals from myriad areas. Since the blog was created in 2009 by Jacques van Heerden, it has amassed such a dedicated following due to its diversity of content. Founded by Tina Roth Eisenberg, Swiss-miss is a design blog, or rather a personal visual archive of the founder. 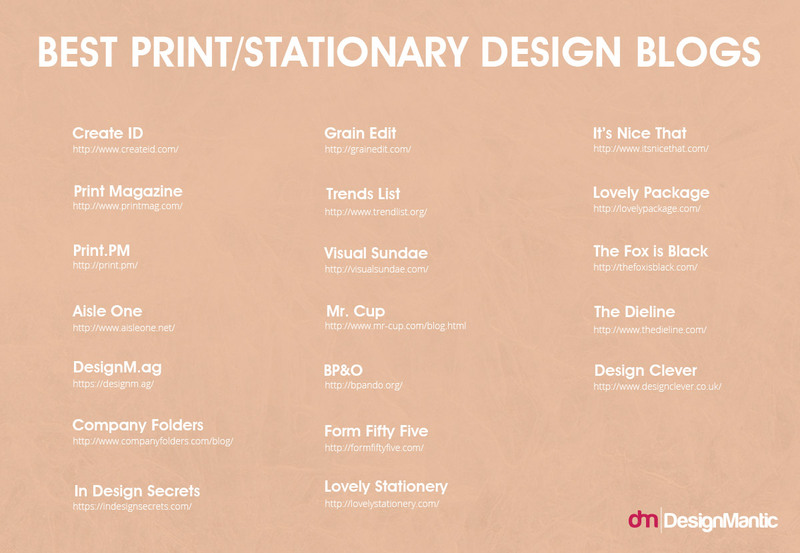 Written in the format of a dairy, anybody harboring a passion for design can find something to their liking on the blog. If you want to learn the secrets of becoming a better designer, this is the right blog for you. It contains valuable posts, inspirations, and helpful guidelines about making it big as a freelance designer. The Creative edge is a compact and neat designer blog, featuring the latest inspiration, tutorials, and news. This includes tips on learning how to be a digital nomad to how to make your next PowerPoint presentation pop. It spans all subjects that hold relevance for designers. The regular creative contests featured on the blog are a bonus, and so is the genuine care it exhibits for the community. Founded by designer Hannah Dollery in 2009, Good Design Makes Me Happy features carefully-curated design examples and minimal write-ups that speak volumes for themselves. 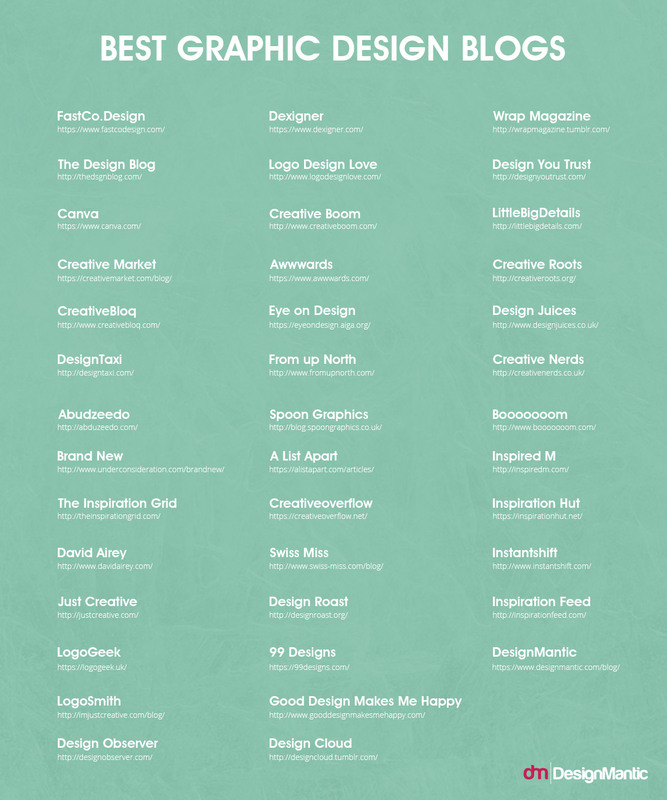 This site is a pretty spectacle for designers looking for eye candy… nobody’s judging. Design Cloud is an informed blog that incorporates carefully selected images of new works, covering a wide spectrum of design fields, from architecture to graphic design. This Tumblr blog is easy to navigate and beautifully laid out. Wrap magazine is in essence a print magazine that celebrates contemporary illustration and is published twice a year. On the other hand, their blog features a specific style of illustration, in addition to portraying additional works by inspirational artists and highlights from the magazine. This Tumblr blog keeps up a never-ending stream of eye candy, which is perfect for fueling your inspiration. Founded by Dmitry Utkin in 2007, “Design You Trust” is an hourly-updated community and collective design blog, replete with video design, architectural inspirations, creative advertisements, fashion, photography, design articles, young design bloods, great design portfolios, events and news, new design trends, and hand-picked design stuff from all over the world. LittleBigDetails is anything but your average design website. This blog is clever, funny, and fresh, due to its curated collection of design details. 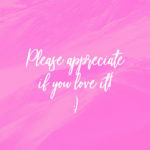 Their short and succinct posts make sure you stay entertained, and their awesome collection of creative tips will keep you riveted for hours. Creative Roots plucks at the strings of your heart and make you believe that good wins over evil. The blog aspires to lay out stunning representative design on the world map, works of art and design that elucidate the basic core of humanity and personify nations. It’s time to appreciate our similarities, instead of reveling in our differences. This blog does a great job of exhibiting gifted illustrators, photographers, designers, and more. True to its name, their insightful interviews would get your creative juices flowing by elucidating work of today’s top designers. They reward their loyal readers with freebies and giveaways, and the care and effort they invest in their articles make them truly a gem. In addition to Photoshop brushes, fonts, and free icons, CreativeNerds also has a resourceful YouTube channel featuring amazing step-by-step tutorials. They also post a plethora of extensive round-ups like“50 Phenomenal Free Photoshop Brush Sets,” which their readers absolutely love. This extremely playful Canadian illustration blog features unusual and surreal illustration work that provokes thought and exude creativity. Always worth checking for new illustrations and indie art. Inspired by Wired Magazine and Smashing Magazine, InspiredM was started in 2014by Catalin Zorzini. The blog is a treasure trove for web designers hunting out creative input and inspiration. The inspiration hut brings to the table hauntingly beautiful typography, sculpture, photographs, paintings, patterns, illustrations, and so on. Each exhibited piece is thought awakening, insightful, and meticulously hand-picked. If you are searching for thought-provoking, detailed, and carefully written articles on design, you’ll fall head over heels in love with Instant Shift. This blog is mostly frequented by web developers and designers. Bonus: we love their freebies! Just as the name implies, this blog is a food for inspirational thought. Like other sites in its niche, Inspirationfeed also offers freebies and resources, but they also feature articles with business motivation, social media advice, and start-up resources. DesignMantic is a commendable online logomaker tool that lets you create custom logos for free. Even if you have no design expertise, DesignMantic incorporates ready-to-use logo design templates which you can use from and customize to your business’s needs. The blog of DesignMantic is a kaleidoscope of color and design, incorporating value resources for graphic designers and SMBs. Smashing magazine is one of the best development and design blogs that prioritizes quality over quantity for its content. Every article is based off the latest techniques and trends dominating the market. In addition to the valuable free content designers can glean from its blog posts, smashing magazine also offers tickets to attend Smashing conferences and books in print or E-book form. Specky Boy Design Magazine features plenty of posts about WordPress and web design, but their creativity doesn’t end here. They also feature tips for design agencies and freelance designers, tutorials and freebies, weekly design news posts, and weekly web design inspiration posts. Since founded by web designer Walter Apai in 2010, WebdesignerDepot has amassed a huge following over the years. The blog aspires to share techniques and tips pertaining to the web development and design, the best and latest discoveries, and cover the business side of working as a freelancer. Core 77 caters to a loyal audience of industrial designers, acting as a valuable resource in addition to a means of bringing designers together with shows, awards, and competitions. Apart from industrial designers, the blog also makes for an interesting read for any enthusiast organizer/space design, or even non-designers who have a penchant for pretty things. Brainchild of Ray Cheung, a web entrepreneur, WebAppers features top-notch open source resources for both developers and designers alike. Designers can benefit from their extensive collections of inspirational resources, fonts, brushes, stock photos, and icons; all categorized according to their licenses to make them more searchable. HOWdesign.com is your go-to place for all “HOW” queries. Find excellent advices for success in your in-house, design firm, or freelance career. Tap into inspiration galore in terms of interactive content, information about specific disciplines, and cutting edge design projects to keep you at the front of the pack. The leading online publication features tech advances, and the latest cultural and business news. The blog is not entirely focused on design, but also possesses a dedicated Design & Dev section which is invaluable for professionals of these fields due to its coverage of the latest developments within their fields and combination of tutorials and tips. SitePoint has become somewhat of a Makah for web professionals belonging to all sorts of web-related fields including entrepreneurship, SEO, product creation, programming, development, and design. If you want to garner access to every book ever published by SitePoint and thousands of available video tutorials, be sure to select their premium membership option. Envato’s Tuts+ truly embodies the concept of hands-on learning by helping people practically apply their theoretical knowledge in areas such as web design, photography, illustration, coding and more. Tuts+ is one place where you can stumble upon tutorials that you can follow at your own pace. All those looking for design-orientated content as well as business-related articles, should definitely checkout Design Shack. Its articles span across everything from CSS hacks to freelancing tips, which can help you create better web designs. Web Design Ledger serves as a platform where designers can share their resources and knowledge on everything from interviews and inspiration to tips and tutorials. Written by web designers for designers, this blog is regularly updated with highly valuable content. 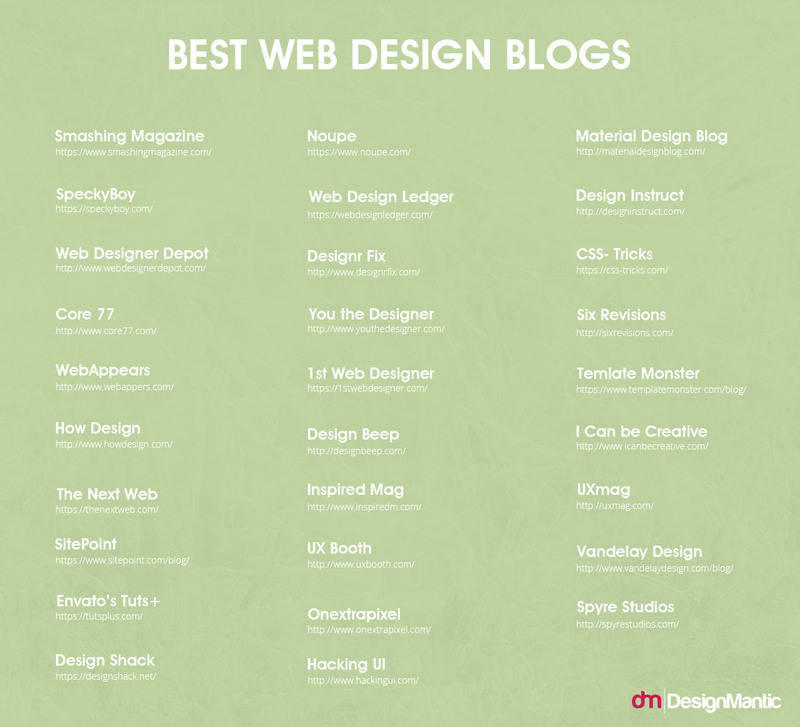 Designrfix should be in the bookmark list of every web designer. With its daily dose of useful and inspiring articles, designers can learn plenty of new methodologies and frameworks, as well as discover creative ways on how to be more productive. You can also benefit from their resources, deals, tutorials, freebies, and more. YoutheDesigner is a reservoir of inspirational design work. Their works include hefty write-ups on design and art in every niche, as well as tips for website design and blog, freebies, tutorials, and educational resources. With an easy to navigate and compelling website, you can browse through other categories like photography or business, or stroll through the freebies and resource section. Feel the pulse of the design industry with the teeming blog 1stWebdesigner, Co-founded by James Richman. It caters to a highly active community of entrepreneurs and web designers. The minimal and simple blog features posts on everything from font collections and theme reviews to UX trends and CSS templates. Design Beep publishes fresh and inspiring content for developers and designers aspiring for free collections, tricks and tips, tutorials, inspiration, and everything else related to design. They also post weekly round-ups of web design inspiration and a weekly round-up of new design resources that you should keep an eye (or two) open for. Inspired Mag combines topics pertaining to the lifestyle, design, and web, and offers raw material that fuels the inspiration of all their readers. The blog offers excellent resources in categories like freelancing, WordPress, reviews, and web design. In addition to perusing the daily posts, have fun exploring their freebies and deals. UX Booth offers some of the best resources for UX professionals, posting articles on topics covering everything from visual design and accessibility, to research information, user experience philosophy, interaction design, information architecture, and business and content strategy. Since the publication was born on 2008, it has collected hundreds of pieces by dozens of UX specialists. The web magazine Onextrapixel shares latest news and useful resources on web development and design for every web professional. Whether you are having trouble with your WordPress theme, trying to learn some new Photoshop tricks, or looking for inspiration while picking a font for your logo, Onextrapixel is your go-to blog. From social media to illustration to photography, it has all of your bases covered. Founded by David Tintner (developer) and Sagi Shrieber (designer), Hacking UI is a front-end development and interaction design magazine. The blog is a goldmine of curated content, leveraging a viable mix of development and design related articles to help developers and designers develop their professional skills. Inside, you’ll find insights into business-end matters, and excellent step-by-step tutorials and podcasts. Material design has carved a cozy niche for itself in the design world, and it is here to stay in vogue for a long time. This blog is a repository of the best examples of material design out there, in addition to publishing apps and tutorials to aid designers in their day-to-day jobs. At the heart of Design Instruct are round-ups of inspirational tips, professional advice for web designers, and in-depth tutorials about web development. The blog came into being in 2010 as a collaboration between Jacob Gube and Isaac (a web designer/developer and a photographer respectively), as an open source project to all contributors with an interest in art or design. CSS-Tricks is a web development and design blog by Chris Coyier, intended for front-end developers and web designers. Inside you will find a web design forum, an almanac, code snippets, and engaging design videos and articles. Template Monster’s MonsterPost is one of the few development and design blogs out there that has spanned an entire decade. Readers can teach themselves new skills by capitalizing on the many tutorials available on the blog, garner access to useful tools, and stay abreast of the latest news and reviews. Touting a collection of intriguing articles on design, mostly Illustrator and Photoshop, web development ideas, and fun freebies, I can be creative is a highly complex resource for designers. The entrepreneur designers can find great management and business suggestions there. The visuals they post combine the advertorial and the artistic to create an art form in itself. Specifically created to cater to the needs of User Experience designers, the blog exploits the psychological and technical aspects of great user experience, visualization, and storytelling based on user-centered research. UX Magazine goes straight to the core to unravel the inner workings of the industry machine, instead of barely scratching the user experience surface. Vandelay Design is a prolific resource for all developers, web design professionals, and even entrepreneurs who want to take their respective fields up a notch. Aside from sharing only the best content for their readers, they also tout a shop which is stocked with a huge collection of handcrafted graphic resources, including icon packs and resume templates. The extensive volume of inspirational posts shared by the Spyre Studios blog, has caught our fancy due to the breadth and depth of their articles. All of their inspirational article draw from myriad corners of the web to lay out as many perspectives as possible, that designers can reference when creating their designs. They also offer many tips and tricks to help designers hone their craft. This brilliant blog features the best of articles, news, and package design from around the globe. The blog focuses on quality over quantity, and captures only the very best the market has to offer. The print Magazine has been nurturing a dialogue about design since founded in 1940, by detailing the intersections of culture and art. Instead of delving in to the “How-to” of design, the writers at Print seek to cover the “why”! The rise of digital hasn’t yet rendered the love for print obsolete in the design world. Print.PM celebrates the love for print like no other, by posting a constant visual supply of great print design examples, from billboard posters to magazine spreads. This is a great place to start for designers seeking ideas for their own layouts. Hailing from the heart of NYC, this excellent resources blog concentrates on graphic design and typography with an emphasis on modernism and minimalism. DesignM.ag is a popular blog for developers and designers. The site includes a web design job board, a community-based news section, and a blog. A crème de la crème blog that answers all questions related to graphic design and stationary design in particular. 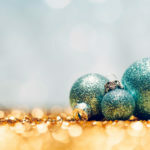 A subsidiary of the Creative Publishing Network family of services and sites for creative professionals, In Design Secrets features the best in advice, tutorials, and news to publishing and design professionals worldwide, through its newsletters, video casts, and properties’ podcasts. With its focus on 1950s-1970s inspired design, Grain Edit has been a staple for over a decade. The site is a haven for anyone in search of vintage aesthetics. Dave Cuzner, the editor of the site offers product reviews and helpful tips, talks about traditional and contemporary design pieces, and conducts thoughtful interviews with designers. While Trends list doesn’t criticize contemporary graphic design, it simply takes a stance that like everything else, graphic design is affected by certain trends. The blog incorporates a plethora of designs categorized by their inherent design trend. Each page flaunts a small infographic for each trend, which is quite revealing. VisualSundae is an assemblage of interesting ideas, a collection of top drawer design and art. There, you will stumble across fine arts exhibitions, a compendium of sculpture, typography, and graphic design and illustration projects for sold goods. All artists, running the gamut from amateur to accomplished, are featured here. French designer Fabien Barral, often recognized under the pseudonym Mr Cup, uses his blog Graphic Exchange to share his extensive experience working on high-profile international projects. The blog “branding, packaging, and opinion” is run by the editor of The Dieline and the British freelance designer, Richard Baird, who excels at the development of packaging and branding. Baird selects recently created designs from around the globe, and shares his opinions and thoughts on each, after providing a short background. Curated by a whooping team of more than thirty top-notch designers from UK, FormFiftyFive is the epitome of the power of collaboration. Operating for over a decade, the site has been delivering a mixture of work examples, image galleries, and links, in addition to more in-depth interviews and features. Whether you are trying to know more about spot varnish, or seeking out a new source for brand identity design inspiration, Lovely Stationery should be your go-to site. The recently launched site features spectacular design works from around the globe, including letterheads, business cards, brand identity systems, and other print marketing pieces. Founded in 2007, the blog has become an invaluable resource for design and art projects and news. While a central blog is the highlight of the website, it also features designers’ works, printed publications, and upcoming events. From pop-culture to highbrow, the website has a little bit of something for everyone who is anybody creative. Lovely Package is another site which is devoted entirely to packaging. It features one package or brand per post in its simple layout, and it’s a straight-forward and easy way to learn more about what branding designers are doing or find branding inspiration. Combining the best of design and art, one can expect to find everything from daring music cover art to cutesy illustration, up-cycled furniture to experimental photography. The blog is a great place to discover new talent and find a wide array of projects where you can apply your own design talents. Founded by Andrew Gibbs, the purpose of the blog is to promote some of the best package designs over the globe, and provide a community where package designers can critique, review, and stay abreast of the latest projects and trends in their field. The amazing Tumblr blog, Design Clever, was created by designers Bethany Baker and Jonathan to celebrate talented creatives. You can seek out inspiration from others or even submit your own work. By supplying a daily dose of pointers and inspiration, Typewolf aims to assist developers and web designers with typography. The non-scaled down, and large screen-grabs portray the fonts used in each design clearly, and depict fonts in use on actual websites. The blog also offers background info about the font and recommends similar fonts that can be used in the same context. Typetoken is a collaborative effort of web designer David Cole of Mayfield Digital, and web designers, Marc Millic of Modular lab and Mike Sullivan of Mister. This site is organized neatly into sections; art, identity, event, visual language, typeface, theory, publication, and icon. British-born graphic designer, publisher, and writer, John Boardley, is the brains behind one of the most popular typography and font blogs in the world, I Love Typography. The pioneering blog has amassed a wealth of followers by offering interviews, news, and training advice it features on the subject of type. Typographica is a review site for type books and typefaces, with occasional commentary on typographic design and fonts. Designed by Chris Hamamoto and edited by Stephen Coles, the blog was founded in 2002 by Joshua Lurie-Terrell. An interesting and beautiful weblog about found type, typography, and lettering. The Type Directors Club is a leading international organization, aspiring to support excellence in typography, both on-screen and in-print. The blog celebrates its diverse and talented membership by featuring a monthly member profile. Type Theory is a journal of contemporary typography featuring interviews, reviews, views, and news – an informative blog centered on typography that covers everything from the history of type, to resources, observations, and typographic news. Type for You nurtures a community of lettering enthusiasts, with news and relevant interviews, keeping their readers up-to-date and well informed with the realm of typography. This typography blog is managed by an independent type foundry, Parachute. This site offers useful tips and techniques, up-to-date news on fonts, trends, new font releases, and pre-release notifications. The blog is updated several times a week, and articles are replete with content, both in images and writing. If you are intrigued by the world of typography but don’t know where to start, Typedia is your go-to resource. The site is updated by designers, the likes of Liz Danzico, Dan Mall, and Jason Santa Maria, who love type. Typedia is somewhat of a mix between Wikipedia and IMDb, just for type. Anyone can join, edit or add pages for typefaces, or for the creative minds behind them. Font Feed finds digital types at work in the real world, typographic techniques, and recommended fonts, with real life examples on how to put typography in use. New York is Luke Connolly’s first love, and there is no way to express that love better than by photographing its best typography. Luke Connolly features all five boroughs of New York, making his blog a vibrant repository of every kind of typography you could ever wish for. This curated collection exhibits outstanding design and typography from 182 creatives from 36 different countries around the globe. Incredible Types features 166 pieces of type design that you can glean inspiration from. The stylish black and white design of the website makes projects come to life when selected. Created by Costa Rican Ricardo, this self-explanatory blog focuses on good typography, and everything pertaining to it. Typostrate’s accumulation of type wards off any inspirational woes and designer’s blocks you may be hampered by. This brilliant blog features type lettering in all styles and colors, sizes and shapes, by a handful of talented artists. The simple to use, organized, and clean site allows you to take in hundreds of inspirational images as you scroll down. Famous for its ability to identify any typeface, this website is a great resource for research and type identification. Simply input images and the intelligent site identifies the typefaces used. The collection is both helpful and inspiring for designers and typographers alike. On this resourceful blog, you can find a selection of interesting, pending font events, font posts on various typographic topics, and the latest information about font news. Copenhagen design agency e-Types are obsessed with typefaces, and so they set up the online type foundry Playtype. This chic website lets you read news and buy fonts, in addition to finding out the details on the Playtype store, where customers buy digital fonts in a physical space. 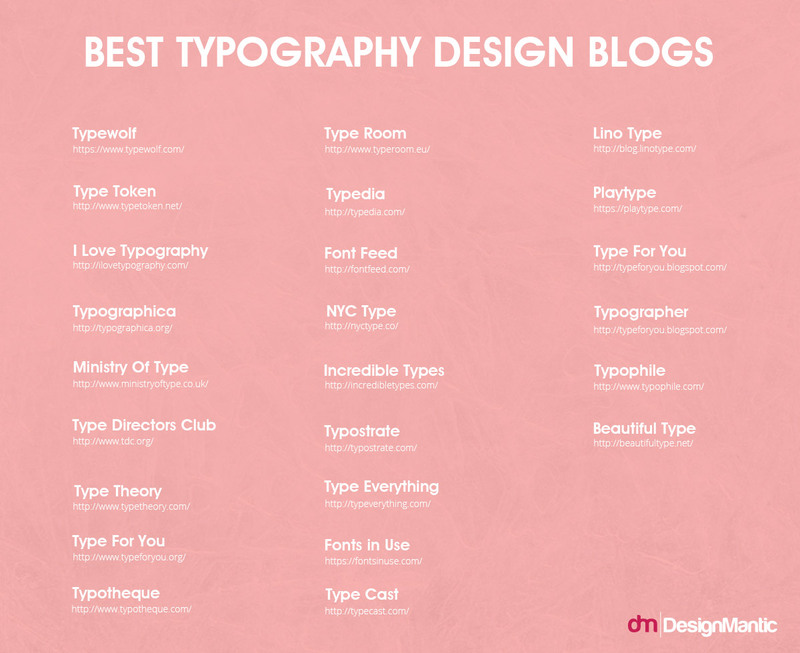 Hosted by BlogSpot, Type For you offers interviews, events, font reviews, and insight on articles pertaining to typography. David and Yves write about up-to-date news on typography related topics on their blog, Typographer, as an evolving project. Lacking in typography inspiration? Typophile is one of the oldest Typographic forums, where you can find often exceedingly pedantic and lengthy discussions that run the gamut from technological fixes, historical referencing, type identification, precise points of debate, to innovative industry news. Founded by web designers Aurélien Foutoyet and Francis Chouqet in 2007, Beautiful Type is a stunning Tumblr blog showcasing inspiring videos and incredible typography illustrations from around the web. It even has a page dedicated to type related books and awesome design. This European Foundry is another resource that is helpful for novices and typography instructors in the typographic research arena. With its exquisite typefaces and featured articles, this blog is helpful for any designer wanting to access design and typographic criticism in either an academic or a casual capacity. Typecast is a resourceful app that lets you quickly style type in the browser, and check for beauty, rendering, and readability. The website lets you choose from 90,000 different web fonts from around the world, and compare fonts side by side. Can you think of more design resources that every graphic designer should know of? Do let us know in the comments below!